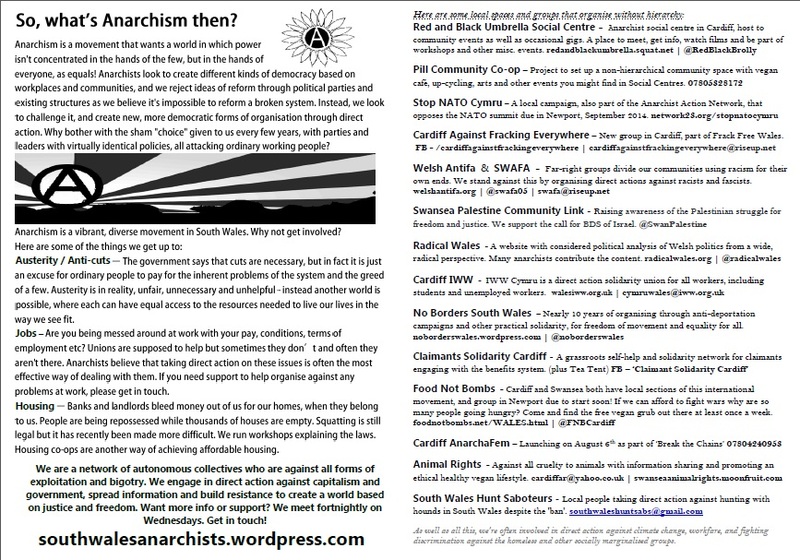 South Wales Anarchists have produced a new leaflet to distribute in info-shops, during miscellaneous demos and generally across South Wales, and to have at hand to explain who we are and what we get up to. Look out for it at the Red and Black Umbrella as well as the upcoming People’s University building and on the table at Food Not Bombs on Fridays. 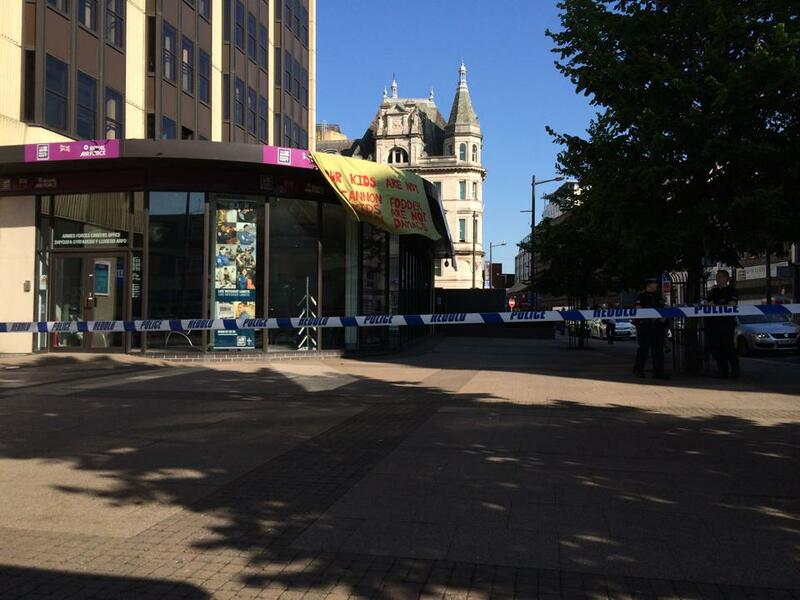 As soon as a stall was set up in the town centre the police made their presence known, with a mixture of “Community Support” officers and actual coppers surrounding the table – groups of two standing at either end of the street and four walking passed repeatedly, taking leaflets and demonstrating their cutting edge intelligence gathering techniques with questions such as “What you up to?”, “Are you moving on?” and “Are you doing this anywhere else?”. 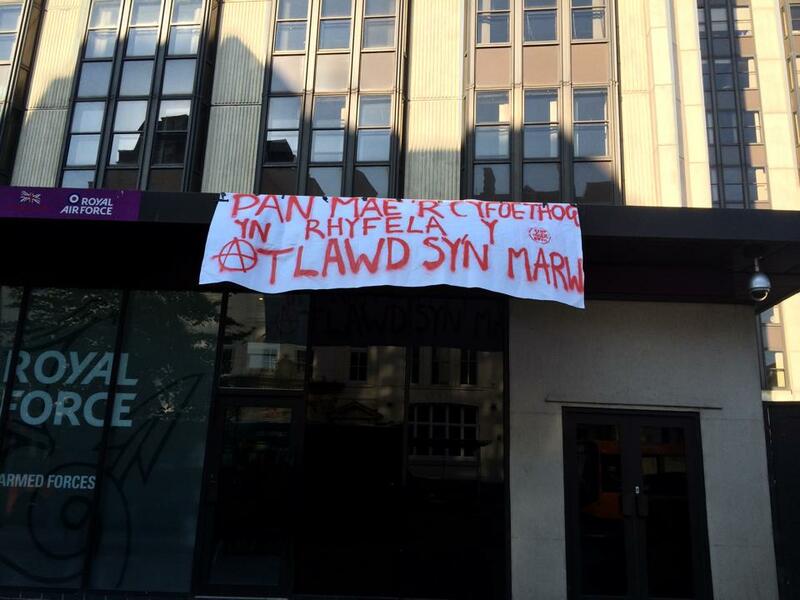 Later that day a meeting was called in a public community centre to plan local and national opposition to the Nato Summit, with a warm welcome to anyone who wished to attend – apart from cops, who couldn’t seem to grasp the fact that it wasn’t for them. 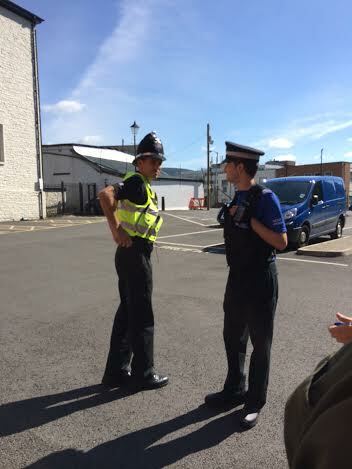 Two police (55608, plastic copper, and 4680, fully-grown porker) told staff at the community centre that they’d come to find a meeting – “something about Nato”. They hung around in the adjacent cafe, peering in to the meeting room, realised that they’d been noticed and proceeded to take a walking tour of the outside of the building. When confronted by activists they admitted that “We’d heard there was a meeting”, refused to disclose where they’d heard and walked off, ignoring requests for further details. 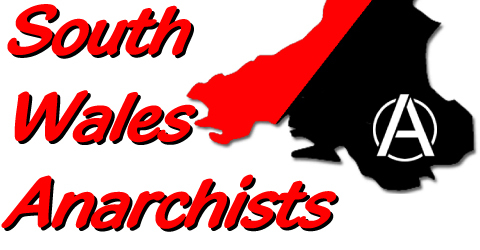 What’s clear now is that Stop Nato Cymru and South Wales Anarchists are networks that are well and truly on the state’s radar, with the likelihood that this website, social media and possibly emails are being closely monitored in the run up to the Nato Summit. Making this so blatantly obvious was either an idiotic mistake by Merthyr’s police or an attempt to intimidate activists before the Summit, in which case they failed spectacularly. That anti-war and social justice campaigners can be targeted in this way, just for their attempts at social change, makes our reasons for targeting the state all the more justified. When 60 “world leaders” besiege Newport for two days in September and the heavy muscle of the state tries to keep their circus going by suppressing dissent, we will be ready and more determined than ever to make our feelings known. Warning: These individuals could be dangerous, intrusive and potentially violent. Stay away if spotted in public. 4680, left, real copper: Grey hair, short-back-and-sides, balding, clean shaven, average build, between 5″7 and 6 foot, possibly late 40s. 55608, right, plastic cop: Dark hair, clean shaven, average build, between 5″7 and 6 foot, possibly late 20s or early 30s. This Wednesday (9th July) there will be a day of anti-militarist outreach and actions in Merthyr Tydfil town centre, with local people and activists from South Wales Anarchists, Stop NATO Cymru and No Nato Newport uniting to raise awareness of why we will protest this September’s NATO Summit, why Nato’s expansionist agenda must be challenged and how we intend to do this. This will be followed by a joint meeting of Stop NATO Cymru and South Wales Anarchists in the Canolfan Soar community centre. Merthyr is a community which recently suffered cuts to some of its most vital services, with £15 million worth due to be made in oncoming years. 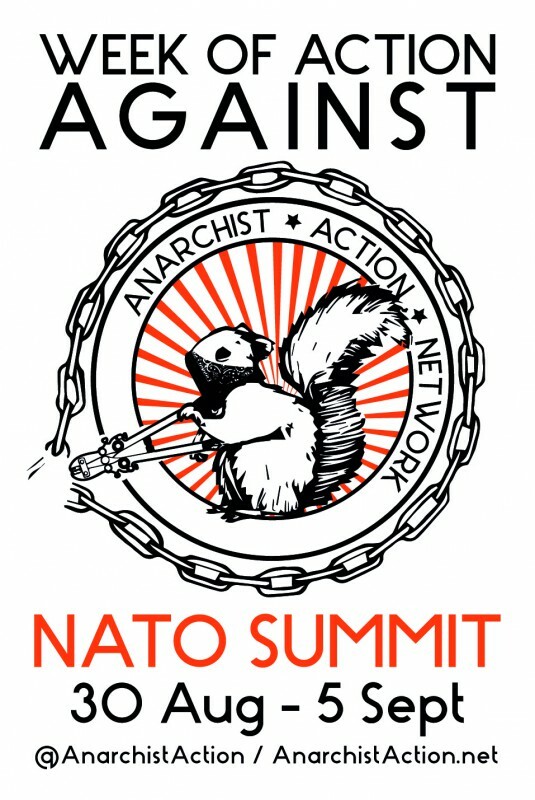 Although figures on the exact cost of the NATO Summit – the 10,000 police due to descend on the city and the day-to-day cost of NATO membership itself – are curiously difficult to find, what we do know is that endless trillions is spent on imperialist powers fighting each other while ordinary people from Merthyr to the Middle East suffer under deprivation, poverty and the daily grind that keeps the system going. All are welcome to come and help distribute leaflets, talk to the public or just to find out more information about our campaign.